I am ever in search of easy dinners. I love meals with simple ingredients – the fewer the better…honestly. I recently stumbled upon a pin that caught my eye as a great dinner option! I made it tonight and tweaked it just slightly and the finished product was so reminiscent of my childhood “beef-a-roni” that I wanted to share it with you! It is great to find a recipe that rustles up warm cozy feelings of childhood and yes, some of my warm cozy feelings are directly attributed to good ole’ Chef Boyardee. Canned ravioli, spagettios or beef-a-roni were a staple in my household growing up. I loved the nights my parents would go out on a date because it meant eating dinner from a can. Now, my mom and dad have really changed their eating habits over the years and quite honestly, in the 80’s, very few people knew that this canned goodness was really not so. However, I think back fondly on my dinners of ravioli, spagettios or beef-a-roni and I am thrilled to now be able to re-create it in a more wholesome way! I also love this because it is a one pot meal. Fry up the ground beef and onions in your dutch oven or stock pot and then throw in the remainder of the ingredients! If you are using grassfed beef, don’t bother draining the fat from the ground beef because it is good for you! What is one of your favorite childhood dinners? Do you make it as an adult? This entry was posted in Food and tagged easy dinner. Bookmark the permalink. 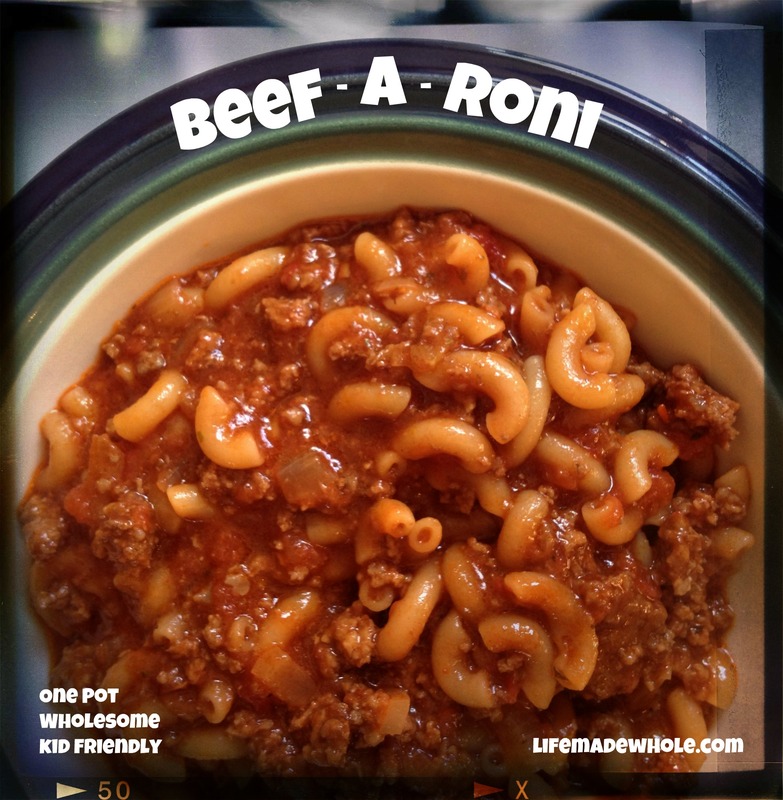 1 Response to Wholesome Beef-A-Roni for the Kid in All of Us! This looks really good. I’ll have to pick up the ingredients at Trader Joe’s, though I may halve this recipe. Anything with even one pound of beef is too much for us.